and a wide-range of businesses across Ontario. Growth is not valuable if it’s ‘here today and gone tomorrow.’ Our advice does not rely on schemes or unproven techniques. Our accountants take the time to understand your business needs, apply our professional capabilities, and then provide you with meaningful advice that will enhance the financial position of your business today and tomorrow. MDP combines the knowledge and experience of a large accounting firm with the personal attention and availability you appreciate from a hands-on entrepreneurial firm. MDP offers a full range of professional accounting and financial services, including, but not limited to, financial reporting, audit & assurance, tax services, business advisory, and private client services. Our primary areas of practice include owner managed business encompassing professional services, manufacturing, automotive, recreational clubs, distributorships, health care, automotive, buying groups, and more. At MDP, our greatest satisfaction is helping you achieve your financial goals! Clients tell us that working with MDP is both an enlightening experience and a genuine pleasure. We support private clients & small to large businesses across Ontario. 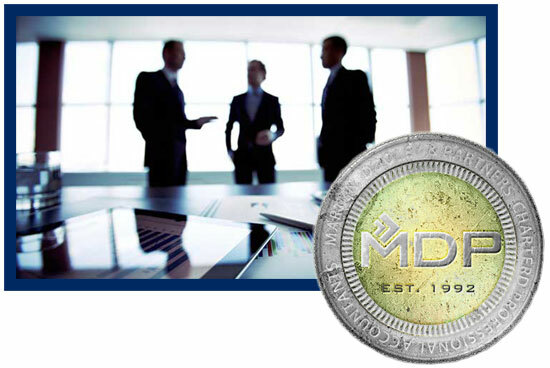 MDP LLP Chartered Professional Accountants was established in 1992. Formerly known as Martyn, Dooley, & Partners, our firm is located in Oakville, with offices in Mississauga, Hamilton, and clients throughout the Greater Toronto Area and across Southern Ontario. We employ over 35 professionals across a magnitude of backgrounds. Our team is comprised of Engagement Partners supported by Consulting Partners, many of whom have obtained their training and experience from two long-established national/international accounting firms.